Two reports by health bodies caught my eye in the last week. First up, the NHS's National Institute for Clinical Excellence (NICE) published a report on dementia which said that for people between 40 and 64 there is no safe limit for alcohol and therefore they should abstain from drinking to avoid it being a trigger for the condition, and now the World Heath Association (WHO) has announced that eating sausages, bacon and ham puts you at the same risk of cancer as smoking. As someone in his mid-forties who regularly drinks beer and eats bacon, ham or sausages most days, I'm clearly in big trouble. 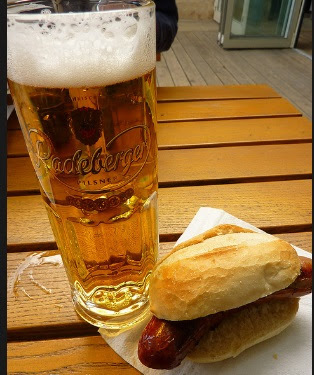 Our beer-drinking and sausage-eating cousins across the North Sea in Germany should no doubt be worried too as they swig their steins of lager and munch their Bratwurst. I accept that there are environmental and animal welfare issues around how meat is currently produced, and health and social problems associated with the excess consumption of alcohol, and not being a scientist I have no way of knowing how accurate the findings from NICE and the WHO are. But even if they are, the messages are so extreme as to make it almost inconceivable that they'll be heeded. And if they were, and we all became teetotal vegetarians tomorrow, there would be massive economic knock-on effects with closed shops, restaurants, breweries, farms, factories, pubs and off-licences. Kingsley Amis put it well when he said, "No pleasure is worth giving up for the sake of two more years in a geriatric home in Weston-super-Mare." From the Woody Allen film, Sleeper. I agree wholeheartedly agree with this piece. So much so that I'll drink to it, but only after my bacon butty.